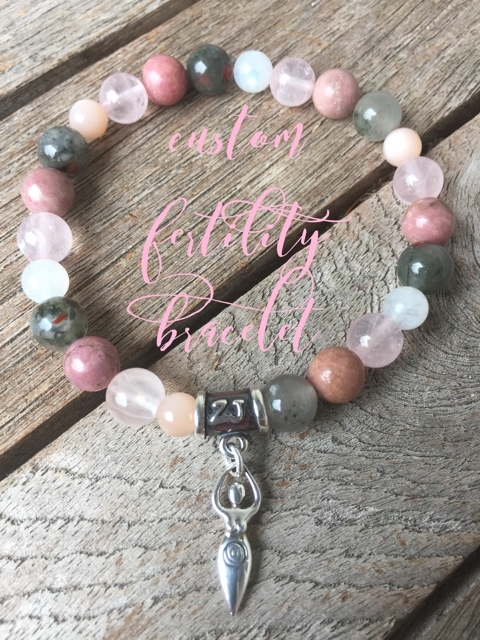 Custom made fertility bracelet. Client requested Rhodonite, Rose Quartz, Multi colored Moonstones and a gemstone to help aid achieving proper Iron levels in her blood so we added Seftonite. "Hi Jen!! I got my bracelets in yesterday. OMG I LOVE LOVE LOVE mine. The colors are perfect. And Loraine's looks even better in person. I love the shape of the stones. Its gonna go perfect with the infinite love one she has. Thank you again for creating these beautiful bracelets. We will enjoy wearing them. Have a blessed day!"